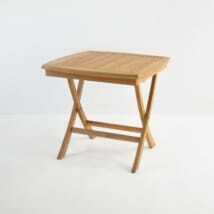 Get accustomed to extreme flexibility with the Folding Square Teak Table, otherwise known as our Bag Table. A table with a handle? Yes, the rumors are true! At first glance you see a perfect square café table, but once you investigate further you will find that this is a handy folding table, perfect for the patio, for taking on holiday or just storing away for special occasions. W27" x L27" x H29"
Pull the leaves away from each other, fold them down and you immediately have a handle for an easy to store and easy to carry table that you can take anywhere! Whether you pair this lovely table up with a complementary folding chair, or go for something a little more robust, its simplicity and elegance will provide you with a stable area to share a quiet meal, enjoy a cool drink during the summer, or a serving table for events! 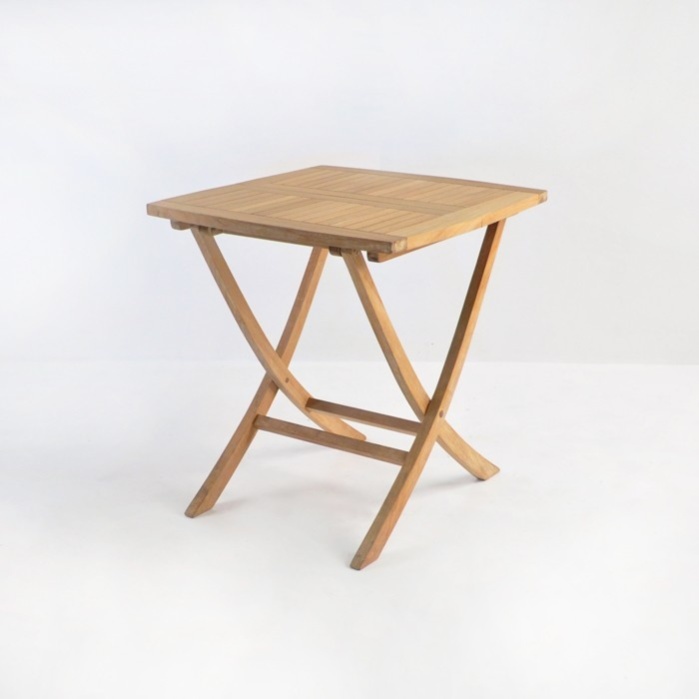 Teak Warehouse’s Folding Square Teak Table is made from none other than our infamous A-Grade Teak wood, recognized for it’s durability and handsome good looks! 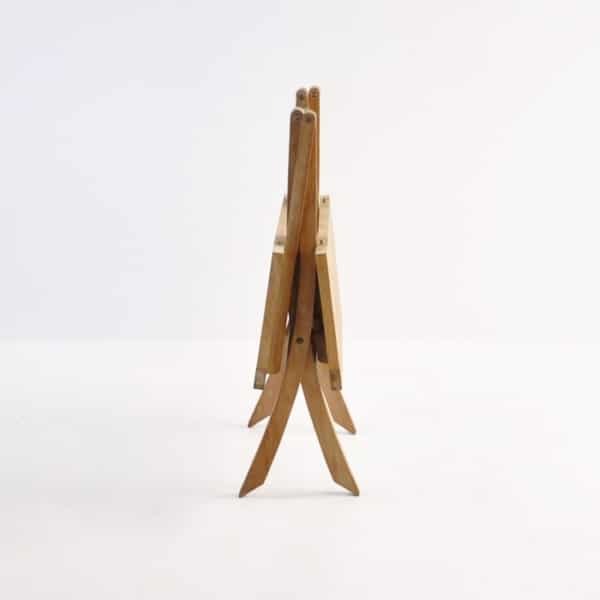 This particular grade of wood means it is taken from a tree aged 40 years old or over, ensuring that the teak tree has generated enough oil and rubber to ensure a long life within each piece of furniture it graces. We sell our wood raw, as we know it will age beautifully. After a few months, you should expect a natural silver-gray color to appear, this doesn’t mean the wood is any less strong – quite the contrary. The only maintenance is simple, just a brief wash a few times a year with a brush or sponge and some warm soapy water and your table will be as good as new. Prefer the honey color? This is also easy to maintain with either an oil or a sealant, available from any good marine store. The Folding Square Teak Table is just one of our many folding table options; we recommend you try two of our more classic folding side chairs with this table such as the Como or Kensington range, or perhaps you love the table but wish to make the whole look a little more modern? Pair it up with one of our new steel and wicker chairs for a fabulous look that will be the envy of your neighbors! 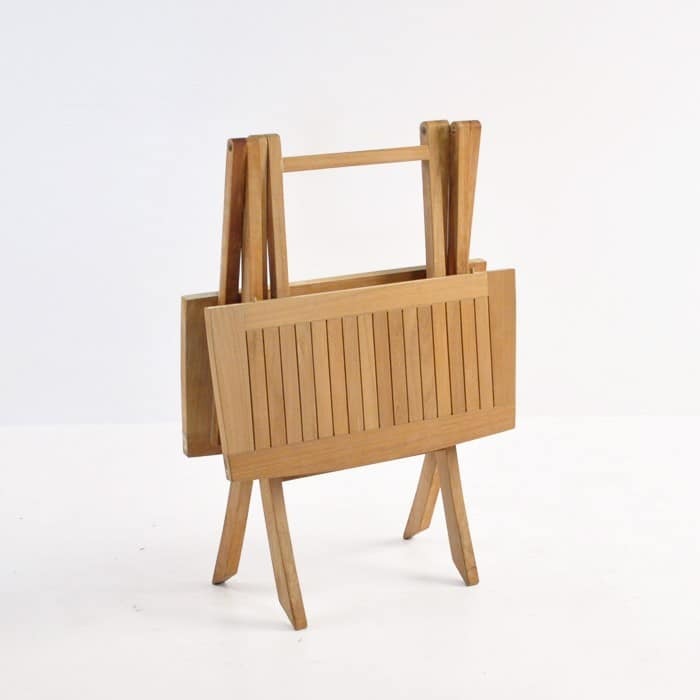 Imagine this stately Folding Square Teak Table in the midst of your glorious green garden, laden with a cheese plate and a couple of glasses of crisp Moscato, idyllic isn’t it? Transpose this same look to the beach, or the park, or even a concert event. 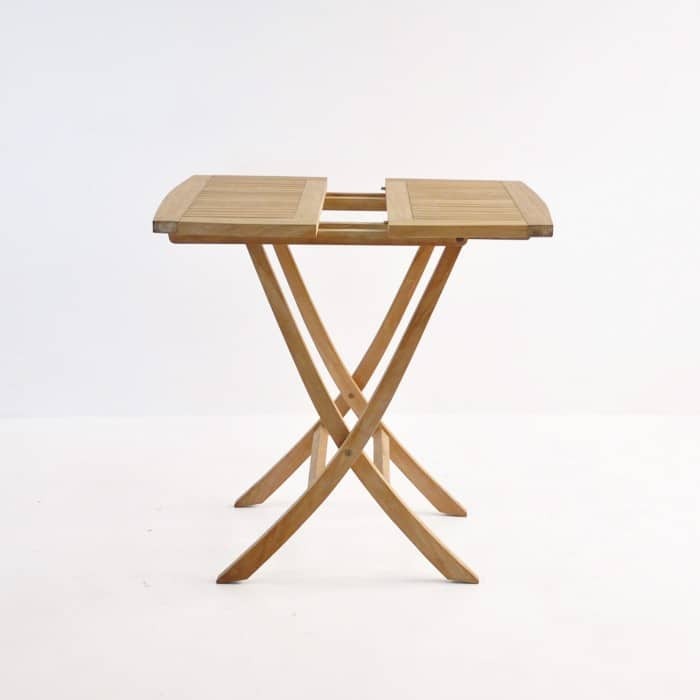 The Folding Square Teak Table will pick and go anywhere you want it to go! We also have a number of people who use this table for indoors as well as out! 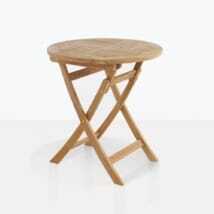 Have it as a back up serving table for large events or as a breakfast table in a petite kitchen. The options really are endless! At Teak Warehouse, we specialize in outdoor furniture, so as well as glorious A-Grade Teak pieces we also carry reclaimed teak, Batyline® mesh, Sunbrella® products, #316 Stainless Steel, Viro® All Weather Wicker and concrete! Choose from a massive range of pieces – check out our loungers, umbrella, deep seating, dining table, arm and side chairs, relaxing chairs, and much, much more. The proof is in our clientele, we have had continued business with our customers since we opened – we offer amazing product at reasonable prices and wonderful customer service and are proud to be over 20 years old for these reasons! Teak Warehouse sells to commercial businesses and residential homes all over the country, and are able to prepare a quote for you, including shipping usually within a day. We prefer to use a white glove delivery service, Plycon Vanlines for nationwide deliveries as the items are quality checked, blanket wrapped and set up in your outdoor space in a timely fashion. Inquire now either online or call to speak to one of our incredible sales staff to discuss the perfect outdoor setting that will suit your space. The Folding Square Teak Table is a brilliant choice if you like options and want to be able to create an outdoor dining area anywhere you go! Purchase it with a couple of chairs that suit your taste and get ready to enjoy the great outdoors.